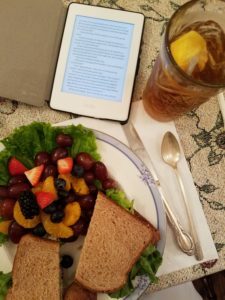 Yesterday, my book club met at a local tea room. favorite ladies in the world. caught up on our summer adventures. Larry and I walked 5 miles today at the lake this morning. and while the mist rose from the water. It gave me a creepy feeling. Halloweenish. 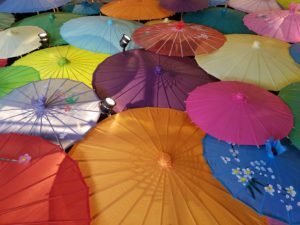 Next week is the marathon at The Dallas Arboretum. I looked up from my work table a moment ago…. 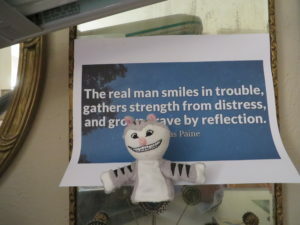 saw the Cheshire Cat in front of this quote taped to the wall. I guess it is all in my perspective. I love book club day. I get to pick out the next book for club…. will let you know the title tomorrow. 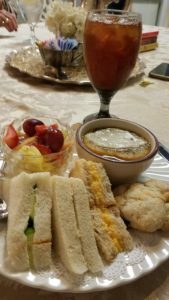 The group met at a local tea room. 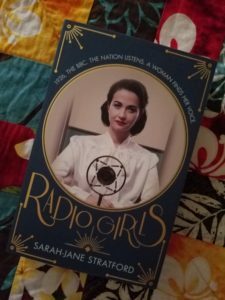 and the book, Radio Girls. After lunch, I went to Farmersville, TX. 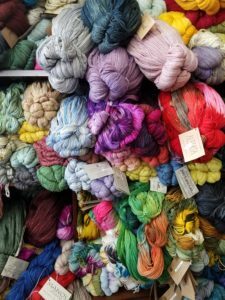 In Farmersville, there is am amazing yarn shop. I am making a Christmas gift…and needed supplies.